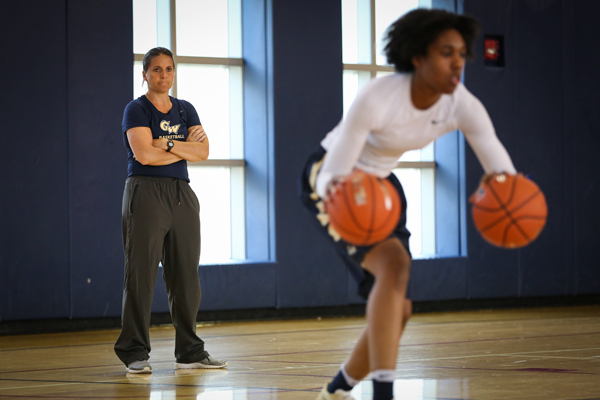 Women's basketball coach Jennifer Rizzotti watches senior forward Ciara Washington in a workout early this summer. Rizzotti enters her first season with the Colonials after 17 years at the University of Hartford. After taking the helm of the women’s basketball team in mid-April, Jennifer Rizzotti has taken over a program steeped in expectations. As back-to-back conference champions, the Colonials have a lot to work on in the offseason to improve on last year’s performance. We sat down with Rizzotti to talk about expectations for the upcoming year, off-season activity and competition within the conference. Responses have been edited for length and clarity. After consecutive A-10 Championships and wins over ranked opponents, opposing teams will be circling GW on their calendars. Does that make it harder to repeat? Jennifer Rizzotti: We certainly will have to be on our toes and expect everybody’s best shot, but we would rather be in this position than on the other side of it. I’ve been in that position as a coach, and it hones your focus as a group and makes [the Colonials] even hungrier to repeat, because they have tasted success, and they know what it feels like. What kind of role do you see newcomers playing, especially graduate transfer Lexi Martins? JR: It is always hard to know how new faces will adjust. We are looking at this group as 14 freshmen, so it is going to be new for everyone, including the coaches. One of the things that Lexi does have to offer is the fact that has already had three years of college experience and success…She will have to adjust to the style that we play and to her new teammates, but with losing the rebounding that we did with Jonquel [Jones] graduating it is nice addition to have her come in and give us some depth at that rotating-post position. With five graduating seniors and only three incoming players is there a plan to add someone else? JR: We are not sure yet. We want to keep options open because there are quite a few scholarships available, even with Lexi coming in. We have some flexibility if there was a transfer that felt right but nothing concrete at this point. I feel good about [freshmen] Harper [Birdsong] and Kendall [Bresee]. I think that they are really excited about the success that the program has had and want to be a part of that. If I am going to add anyone into that mix I want to make sure that it is the right fit. What would you say to a Colonials fan worried about the departures of Jonquel Jones and Lauren Chase? JR: I would say that we have a returning group of players that have a chip on their shoulder because of possibly lowered expectations from outside of the program. I can assure you that their expectations internally have not dipped at all. They know they played quite a few games last year without [Jones] and had some success. They are excited about what they can prove, and there is a championship mentality that doesn’t just go away with graduation. It is also a new beginning for everybody with a new coaching staff, so I think that a casual fan or a die-hard GW fan will be excited about what they will see on the floor next year. What are your offseason priorities? JR: For me, it is just to get to know the players on the team a lot better. As players, I can see what they have done and what they are good at. But in order for me to figure out how to motivate them to play their best, I have to know them better. When they all come back in July we will have a chance to work them out a little and build relationships throughout the summer that will help us hit the ground running in September. Other than GW, who do you see as the team to beat in the A-10? JR: It is hard to say, I have actually done a lot of research coming into this position as to who has been good and what players are graduating from the league. There are quite a few very good seniors in addition to Jonquel and Lauren that have graduated throughout the league this year. It sounds like Dayton will probably come back and be really strong next year. They had a few injuries that set them back but also allowed them to play some young players and get them more experience. It also sounds like the point guard from Saint Louis is one of the best players in the league, and she is returning now as a junior. Certainly those two programs have maintained some consistency. Duquesne has also been really good the past couple years, so I wouldn’t be surprised if they continued to be at the top. The great thing about the league is that there are really no weaknesses, which is good and bad as a coach. For me, I am excited that the competition is going to be really high every night, and we are just going to have to be ready to play. Is it exciting to have Stanford come to the Smith Center and possibly have a game more in the national spotlight? JR: Yeah, anytime you can draw more attention then you regularly do, it is a good sign. Obviously, Stanford’s name recognition is really big so between the fans that want to come out and see them play and more importantly the local girls basketball players hopefully will want to come out. They will be able to see how we stack up. One of our priorities as a coaching staff is to keep the local talent home and make sure that GW is a destination for kids from the DMV, so anytime we can draw them to our arena to watch how we play it will be a good thing for us. I have a lot of respect for what [Stanford head coach] Tara VanDerveer has build for decades on the west coast, so it will be fun to have them out here. After playing under Connecticut head coach Geno Auriemma, have you taken anything from his coaching style? JR: I think there a lot of things that I bring that are more intangible than actual basketball. I have watched a lot of his practices so certainly there are drills that any coach can learn from. What I think is more important is the way that they practice and the intensity with which they perform every single task. When you are a coach, and you need to figure out how to beat a team like that, you need to get your players to be competitive on every single position and want to do every repetition perfectly. I am certainly going to bring those qualities as a coach and try to have those rub off on the players. I have already seen how hard they go and how competitive they are, so we will still need to be focused on being sharp and mentally tough, but I am excited from what I have seen already. As a former professional basketball player, do you think you could compete with the current GW women’s team? JR: If we went half-court and stopped every once in a while, then maybe. It is funny, I have been doing this a long time, so when I started coaching, I was still playing professionally. I would workout a lot with the team as far as their cardio and their conditioning to keep myself in shape. But, as the years have gone by I have consistently slipped lower and lower in terms of being able to keep up. I might be able to play a little half-court ball with them but I am not sure I could keep up with the pace they like to play at. The shot will never go away though. It is just moving around to get the shot.